Barack Obama's 2008 election pledge has still to be implemented. Flickr / Stephen Melkisethian. Some rights reserved. Less than a quarter of the 119 detainees named in the US Senate’s summary report into the CIA’s secret torture programme remain in the military prison for the most ‘hardline’ terror suspects—Guantánamo Bay—the Bureau of Investigative Journalism has established. Research by the bureau and The Rendition Project has identified only 36 individuals who were sent to Guantánamo after their ‘interrogations’ by the CIA—and of those, just 29 remain at the prison on the island of Cuba. One has been recommended for transfer. Another still in custody, Majid Khan, was described in the report as being subjected to tortures, including the brutal procedure known as rectal feeding. Seven of the 36 were released between March 2007 and January 2010; six were transferred abroad and one was sent to a maximum security jail in mainland USA. 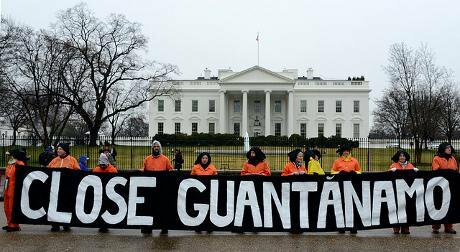 There have been a number of other releases from Guantánamo in recent months, including one last night when five detainees were sent to Oman and Estonia. The bureau has produced a database which begins to provide details of what happened to each of the 119 individuals. It has established for the first time their dates of entry into, and exit from, the programme and shows which of the prisoners were eventually transferred to the US military detention camp. While 36 were originally moved to Guantánamo, the rest were released without charge, sent to other US military prisons in Iraq or Afghanistan or turned over to foreign governments. The Senate's full report ran to 6,700 pages, but only a 499-page summary was published in December 2014 and, within this, crucial details were redacted after objections from the White House—to the anger of the intelligence committee chair, Dianne Feinstein. The summary named 119 of the CIA’s prisoners put through the programme from 2002 until 2008, but it offered no full analysis of their time in custody. It instead gave a few individual case studies. The bureau has produced a comprehensive timeline for the 119 by correlating new information in the Senate report with previously published investigations, legal filings, flight data and other material, including unpublished documents on file with the international NGO Reprieve. In 54 cases, the bureau has established entry dates into the programme to an accuracy of ten days or fewer. Of these, the majority (32) are accurate to five days or fewer. In all but 29 cases, the bureau has established an entry date within a 30-day range. Although the rough outlines of the CIA’s detention programme have long been established by legal teams and investigators, the bureau’s analysis of the Senate report confirms and clarifies many details and offers many threads for further research. It casts new light on the programme’s evolution and eventual dismantlement—showing, for example, that there were 28 people left in the programme in 2006, the year it was effectively dismantled. The research also opens fresh possibilities for accountability and legal redress, according to lawyers who have worked on some of these cases. Three senior lawyers representing a number of former CIA detainees welcomed the bureau's findings. Meg Satterthwaite, director of the Global Justice Clinic at New York University School of Law, said: “This project to restore information blacked out in the Senate report reveals important data about former detainees' time in the CIA's detention system. This kind of careful analysis is crucially important for those working to understand the US extraordinary rendition and torture programme. “For years, we have tried to create tables like the one included here, but essential information was always missing. This table will allow lawyers representing former detainees, human rights investigators, and citizens seeking the truth about what was done in their name to move several elusive pieces of the puzzle into place concerning the fate and whereabouts of the disappeared." *The Freedom of the Press Foundation has launched a fundraising appeal to support further research in this investigation. Please consider donating here.